I love coffee. Maybe I may have mentioned this once or twice on the blog? I’m not much of a breakfast eater though. Unless of course it involves some sort of pastry or baked good. Then I’m all. over. it. Making breakfast cakes is totally my jam. I’ve got a whole section on the blog for COFFEE CAKES! 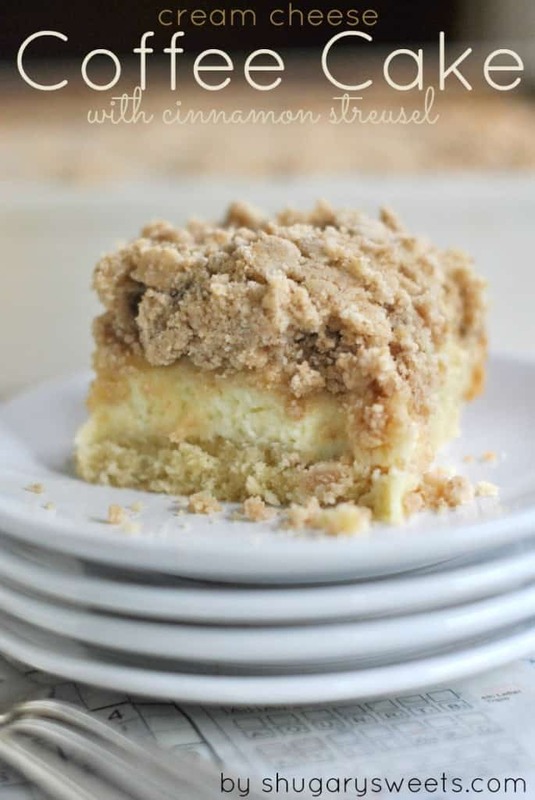 But, not going to lie, this Cream Cheese Coffee Cake is one of my favorites, with it’s thick filling and crunchy streusel topping! Not only does this coffee cake have a moist texture, but I’ve added in a layer of cream cheese (don’t question my decisions!) and topped it with a generous helping of cinnamon streusel. The streusel is very necessary. Yes? Are we in agreement here? You’ll want to grease and flour your 13×9 baking dish. Or, this can be made in two 9-inch cake pans (same oven temperature and bake time). Once you make the cake batter and pour it into the dish, you’ll need to make the cream cheese filling. Make sure you start with softened cream cheese! Pour your cheesecake filling onto the cake batter, and get started on your streusel. I like to use my hands to combine the streusel ingredients, but a pastry blender works too! Generously cover your cake in streusel and bake in a 325 degree oven for 45 minutes. Remove from oven and cool. ENJOY! 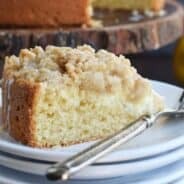 What do I need to make homemade Cream Cheese Coffee Cake? Have all your ingredients ready before starting. An appetite. This cake is amazing, and you’ll find yourself enjoying slice after slice! No matter the time of year, this Pumpkin Streusel Coffee Cake with Maple Glaze is always a huge hit at our house! Make a quick and easy batch of this Cinnamon Coffee Creamer to go along with your coffee and cake! It’s a treat, and perfect to keep on hand. Love streusel? You’ve got to try this homemade Apple Crisp with it’s ridiculous amount of streusel on top! PERFECTION! Thick Cinnamon Coffee Cake has a layer of Cream Cheese and topped with a crunchy Cinnamon Streusel. This coffee cake NEEDS to be made for family and friends. I dare you! For the cake, grease and flour a 13x9 baking dish and set aside. In a mixing bowl, beat flour, sugar, baking powder, baking soda and salt on low until combined. Beat in softened butter until mixture is crumbly. Add in eggs, vanilla and buttermilk and beat until fully combined and fluffy! Pour half the batter into baking dish, spreading evenly. In a separate mixing bowl, beat cream cheese with sugar and egg until light and fluffy, about 3-5 minutes. Pour over batter. Top with remaining half of cake batter. For the topping, mix sugars with cinnamon and salt. Add in butter and combine fully. Add flour and mix with hands until fully combined. Pour crumb topping over batter, sprinkling with hands until evenly distributed. Bake cake in a 325 degree oven for about 45 minutes, until fully cooked. Cool completely and serve. 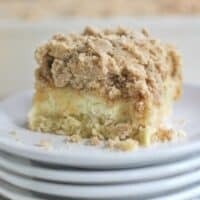 **This delicious Cream Cheese Coffee Cake recipe was originally published on Shugary Sweets on June 9, 2013 and has been republished in April 2018.
lots and lots of coffee for me. I’ve always wanted a Keurig. Right now, some good iced coffee sounds delicious! I’m looking forward to the hot cocoa and maybe some apple cider! Love iced coffee & have just developed a liking (mild word for intense liking) of anything cream cheesy! Can’t wait to try the coffee cake! I’m looking forward to brewing everything in the Keurig! Especially the iced coffee! Coffee cakes are the best for the morning! Or anytime of day! This looks great! I need one of these for my classroom next year! Hahaha see I don’t like coffee but I do love coffee cake! This looks scrumptiouuus! Did you know you can brew Snapple lemonades and teas in the Keurig. And Vitamin burst drinks too! I’m sorta in love and hooked! Oh, and this coffee cake is definitely scrumptious! I think I just gained 80 pounds from the photos 🙂 I would LOVE to have a Keurig – our current coffee system works fine for now, but it’s SUPER old and could bite the dust any day. I’d love to have something more new and modern and easy to use! I look forward to brewing morning coffee, and my kids also love hot cocoa! Keurig would make that so easy and convenient! This sounds to die for! Will be making this like tomorrow! Let me know if you try it Vicki! Enjoy!! I’ve so done that! There are mornings when I need my coffee right now, so I just use the Keurig. Handy little thing it is. This coffee cake looks fabulous. I love anything with the addition of cream cheese. Totally handy! thanks for the kind words Michele! Would love to brew both coffee and coffee! I would love to have a Keurig – I love coffee in a hurry! I had a Bunn, but it broke. This would be awesome – especially to eat with that scrumptious coffee cake! Hot water? Totally LAME! Good luck Kelly!! Cream cheese AND streusel? it must be good! I haven”t tried the iced coffee yet, sounds good! Oh the iced is fantastic!! Good luck Stephanie!! Hot cocoa! And maybe trying some some mocha! Iced coffee sounds amazing right now! Your cake is gorgeous! I have made an adaptation of that CI coffee cake recipe and that cake base can do no wrong. Same with those streusel crumbs, gorgeous!! You are so right. The base and crumbs alone would be delish!! The swirl of cream cheese just takes it to another level. Thanks for stopping by Averie, good luck in giveaway!! I’m not a coffee person. My version of coffee is a cup of English Breakfast Tea in the morning. Look forward to it every morning. love coffee as well! and this cake sounds so good! especially with that cream cheese filling!!! Your coffee cake looks amazing. I love cream cheese in pastries!!! I would look forward to brewing my morning coffee. Hi, Aimee! I would LOVE a Keurig! I’d definitely be brewing some iced coffee & lemonade (yes, they have lemonade to ‘brew over ice’) to beat the summer heat. I would love to brew a white hot chocolate. I love coffee and my Keurig. I make espresso using my k-cup, and I make a latte every day. I have to have two coffees a day or it isn’t a day. I’m a sucker for cream cheese filling (as my latest post proves), so this looks like my kind of coffee cake! I do like breakfast. I’d gobble this up! mmm…this coffee cake looks so good. i love that it has cream cheese in it! I love hot and iced coffee and hot and iced tea. I’m sure I’d get a lot of use out of it! An Iced Coffee would be perfect! MUST. HAVE. COFFEE. And some of that cake, please! I always look at the iced coffee but have never tried it. Sounds like it could become a bad addiction. Your coffee cake looks awesome! Iced coffee – decaf of course, since I’m expecting a little munchkin in a few months. Definitely coffee. We have a keurig at work and it is the best way to make sure we can have fresh coffee any time. No more walking into the kitchen to find a coffee pot with coffee in it from hours ago. I would love to have one at home! What a fabulous breakfast/brunch treat! This sounds awesome! I would definitely use the Keurig for my morning coffee! Your coffee cake will go perfectly with it! We dont have a kuerig but my Mother in law does and I love making coffee, hot chocolate and the hot apple cider in hers! so good! Coffee and tea! Can’t wait to use it for my morning and afternoon treat. I would love to brew some tea. Love the coffee cake……looks delicious. I would say hot chocolate or tea. Forget making this for friends and family – I want it for ME! Looks positively scrumptious. As for brewing – I’m a huge hot chocolate fan but in the summer iced tea would be nice. They also have Snapple Iced teas and Lemonade which are delish! thanks for stopping by and good luck in giveaway Rachel! I’d like to brew some iced coffee. As you had mentioned, it is summer. My basic philosophy is – why not have a little cake with your giant slice of crumb topping? This is perfect. And cream cheese -mmmmm! Yeah. I like that philosophy!! I look forward to brewing both ice and hot coffee. Can’t wait to make tea in it. I know. It’s a bit insane, right? I’m a total coffee addict. I would love to win a Keurig. I’m not a coffee drinker but I’m a huge coffee cake lover. I make them a lot and I also do one with a cream cheese layer. Ridiculously good! Thanks Anita! I love coffee cake too. Did you know you can brew lemonade and Snapple in the keurig too? Fun and delish! I look forward to brewing strong hot coffee in the morining. I would love to make iced and hot coffee. Yes, I can imagine the necessity of coffee! Good luck in giveaway! I look forward to lots and lots of coffee, and iced coffee. I couldn’t survive my day without it. Coffe, tea, cocoa all gets consumed in my house! It would make life easy breezy! I always look forward to iced coffee, lots of iced coffee!! Iced coffee would be great!!! I love a nice mug of hot tea, and that’s what I look forward to brewing! I love iced coffee and iced tea. Both sweet! Love, love, love my Keurig! Look forward to a hot cup of tea every morning. I have been wanting a Keurig recently. I am all about the coffee. My daughter is all about the hot chocolate. I just want one for the versatility. I would love to try the iced coffee!!! Iced coffee would hit the spot! I want to make this coffee cake RIGHT NOW! Oh My I would eat this for breakfast everyday! Looks so delish! I want to brew iced coffee! It’s hot here in AZ and I can save a boatload if I don’t have to stop at Starbucks all the time!! Thanks for the give-away. Coffee Cake looks delicious !! Can’t wait to make ~~ Would love to to brew iced coffee in a Keurig coffee maker ! GREAT GIVEAWAY !! Oh yum!!!!! I can’t wait to make this cake. I can only imagine what that cream cheese does for it! I’m sure it will be even better with iced coffee from that Keurig! My latest obsession is hazelnut coffee…can’t wait to enjoy a cup from a Keurig! Iced coffee for sure! I don’t drink as much coffee in the summer since it’s too hot. Aimee, The best thing about a Keurig would be having a cup of coffee any time of day! I’m a huge 3pm coffee drinker…right around the time I pick up my kids from school, so I’d look forward to trying the Keurig Iced Coffee!!! This coffee cake reminds me of the Starbucks cake. Loooooks sooooo yummy!!!!! I would love to make iced coffee with a Keurig. Iced coffee and tea would hit the spot for summer. Coffee and hot chocolate later. That coffee cake looks delicious! Can’t wait to try it! Thanks for the giveaway. Oh my, fresh hot coffee, fresh hot cake, what’s not to like? Sounds like a dream to me. Coffee! I’ve been dreaming of a Keurig for so long! Good luck in the giveaway Julie!! Mmm, I’d love to brew some coffee, iced coffee, or even hot cocoa to pair with the coffee cake! Cant’ wait to try this recipe! I have one that’s similar but that added cream cheese sounds decadent! Hmm… with a Keurig I would make some yummy coffee to go with the cake of course. Oh my!! An afternoon cup of iced coffee would be wonderful. First of all, your coffee cake looks so incredible! That layer of cream cheese looks to-die-for! And I love hot chocolate as a comforting nightly treat, so I would look forward to making some hot chocolate in the Keurig! I know what you mean about coffee…I can drink eat it all day, everyday. It can be cold, hot, iced, microwaved after the coffee maker has shut off. I don’t care, but a Keurig would help me to have more of a QUALITY addiction. Now on to that scrumptious coffee cake…I am making it for my neighbor Margret who by the way turns 96 tomorrow and LOVES sweets. She no longer bakes and loves homemade goodies, and she too is a coffee drinker. I would use a Keurig the same way you do! Hot coffee in the am and iced coffee in the pm! Coffee, coffee and more coffee! Then maybe a cup of tea! I love iced coffee and iced tea in the summer. So it would be a toss up between those two for the first brew. Mmm that looks so yummy! I’d love to have a Keurig to make some coffee and tea! I love making iced coffee at home! I’d love to have a Keurig to make both tea and iced coffee in! Oooohhh, coffee and iced coffee! I’d be excited to brew lots and lots of coffee! I love coffee and coffee cake! I can not wait to try this recipe!! This recipe looks divine – just the ticket in the morning with a hot cup of coffee! I would like to make iced coffees.. so yummy in the summer time! Did I miss something in the streusel directions? I dont’ see anything about adding the three cups of flour. I can’t wait to make this. My hubby wants be to add some fresh blueberries-what do you think? Ahhh, thanks for the catch. All fixed in the recipe! I think blueberries would be delicious, I would coat them in some flour before adding to the batter so they don’t sink to the bottom. Let me know how it turns out!!! You can’t beat coffee and coffee cake! Can’t wait to make this coffe cake and hopefully enjoy a nice fresh cup of coffee from my new Keurig! I love caramel coffe in the Keurig. But summer is the time for iced coffee. I’ve been enjoying it at the office. I have a bottle of syrup behind my monitor. Don’t want visitors to think I’ve got a bottle of something else that I’m adding to my coffee. But I’ve never tried the Keurig iced coffee. I would like to soon. Lovin’ the hot cocoa in the winter, iced tea in the summer and Donut House Decaf all year long. Best coffee maker ever made. I can always do my favorites and friends and family do theirs. Everyone happy, happy, happy! I’ve always wanted one! Oh how I love iced coffee!!! I love my Keurig for hot coffee and would love to give one to my mom so she can have a cup whenever she wants! I look forward to brewing all of them, especially iced coffee! I made this for my father’s birthday brunch. It was a big hit with family members young and old! Definitely excited to check out the rest of your recipes. I like green tea, my husband drinks coffee and my Mom loves hot chocolate! All would go great with this coffee cake. Keurig is the way go! I love iced coffee, and I look forward to being able to make beautiful big cup of hazelnut flavored, sit with my books on the shaded back porch, and enjoy refreshment for mind and body and spirit. Love the variety Keurig offers!! Love the variety Keurig offers! Looking forward to try hot chocolates! There is nothing about this that I don’t love!! Look forward to how easy it is to make and I don’t have to run out to get coffee! I love coffee and tea. I live that I could have a different flavor for each cup in the morning! Yummy looking. I love coffee cake. Thanks Paul, good luck in the giveaway!! I love to brew hot coffee! Looks creamy and delicious. 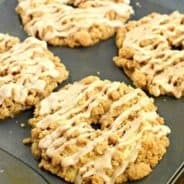 Was searching pinterest for a coffee cake recipe to make today and found this. Thanks! I love my Tazo tea. I would love o brew the sweet escapes dark chocolate hot chocolate in my new Keurig. Dark strong coffee for me. Tea and hot cocoa until baby #2 arrives in the fall then I may just have to become an avid coffee drinker. Any type of coffee for me! I love me some coffee! I am another coffee addict! The only thing better than a really good cup of coffee is when you have a big slice of coffee cake. The are made for eachother! YUM! Thanks to my coffee loving hubby, I’m starting to acquire the taste for it. I still like it fru-fru with lots of syrup and creamer, though. Looking forward to trying out this yummy looking recipe and eating it with a nice cup of coffee! I’m looking forward to brewing some strong coffee! I would love to make coffee and hot cocoa on my Keurig! OOOOOHHHHHHHHHHHHHHH Keurig coffee with this amazing Coffee Cake, what more could one ask for? I’ve been craving coffee cake lately so this is just too perfect 🙂 love this recipe! Dark Magic by Green Mountain is the best keurig coffee I have ever had!!!!!!!! I’m finally able to have caffeine again, so I want it all!!! Since the temperatures have been in the 90’s here I would want iced coffee! I don’t care HOW hot it gets, I still want my coffee! Love the flavor! I love the flavored coffees, no need for sugar then. I leave that to you! Not sure why I am just getting around to seeing this now but…I need a piece of this right now! Iced and hot coffee for me, hot coffee for my hubby! I would love to try the iced coffee! I would love, love, love to win!! I love coffee, iced or hot!! I have been admiring this for a long time. I would love to have my morning coffee, french vanilla is my favorite but would love to try all the flavors i just can’t get with my regular coffee maker. It would also be great for my son’s cocoa and he could do it himself without making such a mess :-). I am looking forward to the coffee. Lots and lots of great coffee! This cake was excellent. I made it for father’s day. I made the coffee cake this evening. Will try it in the morning. It did take longer than 45 minutes. I am using an electric oven abd wonder if the next time try it at 350 degrees instead of 325. This might be a stupid question but is there supposed to be coffee in the recipe? Nope, no coffee in this recipe! Just pairs nicely with a hot steamy cup though! Lol, thanks! I was very confused, I think I read the recipe about 6 times thinking I had missed the coffee. Love coffee!! Hi there. I found your blog the use of msn. That is a effectively written document. We’ll make sure you take a note of this and are available to understand extra of the helpful tips. Many thanks for the posting. I most certainly will certainly comeback. this looks great! does it need to be stored in the fridge because of the cream cheese, or is it ok on the counter? thanks! I made this recipie last night and all I’ve heard today is people raving about it. I highly recommend this recipie. The only thing I changed was I added an extra stick of butter to the crumble. How could more butter possible be bad!?! Nope, extra butter sounds delicious. In the oven. One of my husbands favorite deserts. So glad to hear it Carole!! Love my Keurig(s), yes I have two (2).. one at work and one at home.. looking to get another one for the beach house.. Cream cheese layer and struessel topping: wonderful additions! How would I store this? Would it be okay to leave at room temperature? I keep this one in the refrigerator because of the cream cheese! Looks so yummy! Just want to check first — is it really supposed to have 3 cups of flour in the streusel? Thank you! Hi:-) Can this cake be frozen for a few weeks? Tried this recipe last evening.. Halved the recipe and skipped the filling altogether..Kept the streutsel layer thin.. baked for 40 mins at 350 F… and voila!! Think this would work as muffins? I’m baking for our pastor and there’s no way he’d finish a 9×13 pan (plus I’d get to have some if I made it into muffins). : ) Thanks! Making this cake tomorrow! Yummy! Hi. Can this cake be frozen for a few weeks after it is baked? thanks!!!! I made your recipe a couple of days ago. We are a family where everyone loves their coffee. 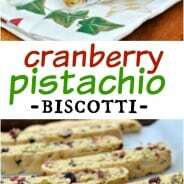 This recipe had the honor to be our family’s superbowl snack! Guess what? Everyone has nothing but praises for it. I’m passing the credit to you now :). Thanks for the wonderful recipe. I’ve been craving something decadent with cinnamon and I needed to use my cream cheese before I move in the next couple of weeks. I stumbled upon your recipe last night and decided to make this earlier today. I just ate a slice and wowza is it good! Hmm, sounds like maybe your measurements may have been off, or that your oven temperature might not be correct? Sorry it’s not working! I have made this numerous times and it’s never done in 45 minutes. I follow the recipe to a T. You’re not alone! Just made the coffee cake and it’s delicious… yum!! Only question I had after making it is, I had to cook it for 1hour and 15 minutes before it was done… is 325°the right temp? 3c flour in the streusel? That’s more than in the cake batter is this correct? Someone needs to start a trend for recipes where there are separate threads for comments. One thread for SERIOUS questions and comments pertaining to the recipe itself. I want to know if you made it and if it was good or not and any issues or adaptations that were made. I don’t want to weed through the “that looks yummy” comments to find out if a recipe is worth making. The other thread of comments would be for the “oh it looks yummy” and other such comments that one takes the time to make for what ever reason I’m not sure why. Most of my recipes don’t have this many comments, but if there is a serious question, I usually try to address them as soon as possible! Like one other commenter who sounds like they actually made the cake, I also had trouble with the timing on the bake. Mine was in the oven probably for close to 1 hour and 30 minutes total as well. The problem was that the center just would not set, but by the time it finally did, the streusel got really dried out and the edges were tough and overbaked. The center was good, but the cake is so thick and high, and large, that the timing was very difficult to get right. 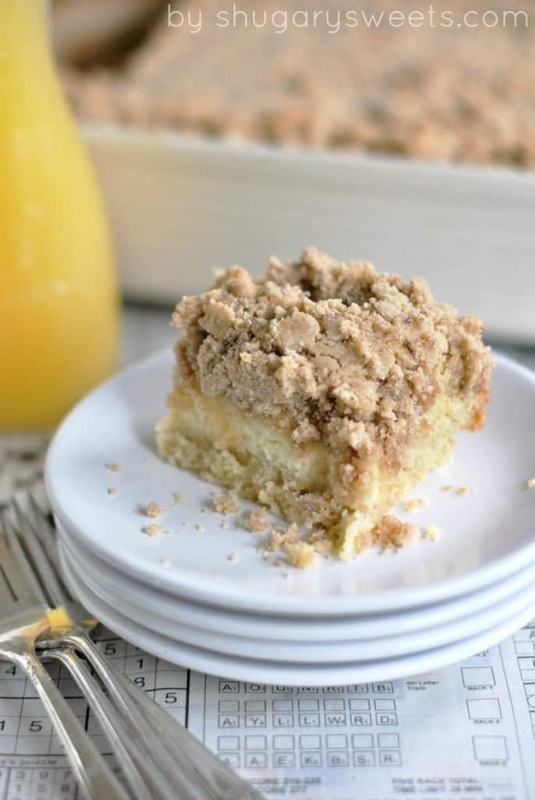 Just want to make this coffee cake and it’s delicious… yum!! The only question I have for making it. Do I need to cook it for 1hour and 15 minutes ? is 325°the right temp? Going to make it on my bestie’s birthday. I’ve bake it for an hr – and it still doesn’t appear fully cooked.